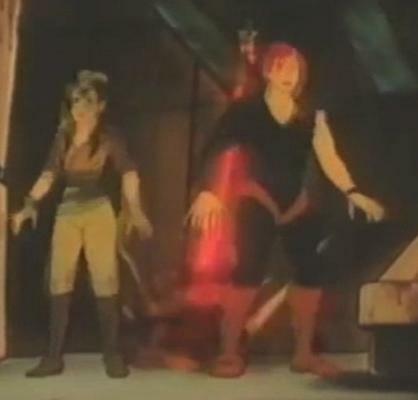 <Cross-posted from Drew’s Views>Continuing on my exploration of Boba Fett’s appearances on television and movies, the fourth time that Boba Fett appears is in the Star Wars: Droids episode, “A Race to the Finish” (1985). 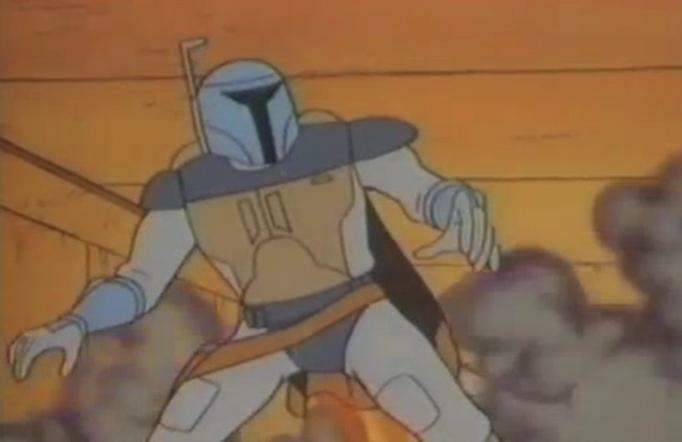 While Fett is not the main character, he does play a pretty important role in this episode, which takes place before Star Wars, Episode IV, so it’s actually the earliest chronological appearance of Fett thus far. And, yes, if the animation looks familiar, that’s because this series was animated by the same company that animated his first appearance in the Star Wars Holiday Special. 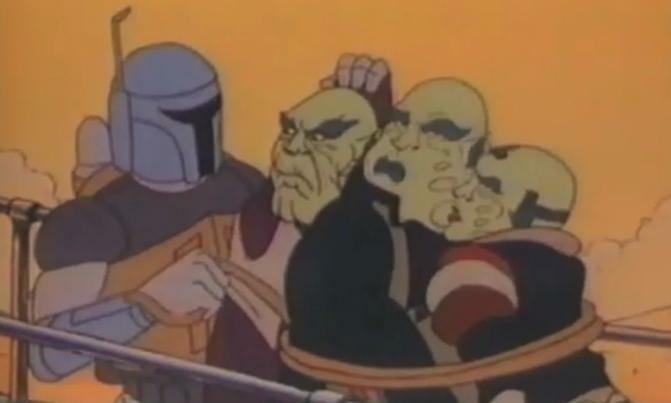 Boba Fett appears, courtesy of Sise Fromm, to whom Fett owes a favor (which is why Fett won’t turn in Fromm to Jabba the Hutt, who has a bounty out on him (“Have no fear, Sise Fromm. I owe you a favor: I shall do as you ask.”)). However, he sternly addresses Fromm by saying: “No one escapes me. I have someone on the job. Just remember: after this, we are settled, Sise Fromm. 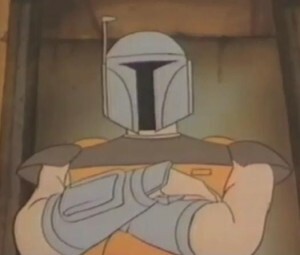 After this, I owe you nothing.” This portrays Fett as being involved in this strictly as a business deal and not a friendship. 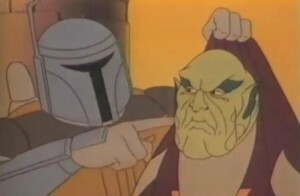 We can get a sense of Fett’s reputation, when Tig Fromm worriedly inquires to Vlix Oncard: “Why are we getting mixed up with that bounty hunter?” Oncard replies: “Ahhh, they don’t come much worse than him. I almost feel sorry for those two speeder racers.” From this dialogue, it’s clear that Fett has a reputation for being rough and that they are aware of him and scared of him. 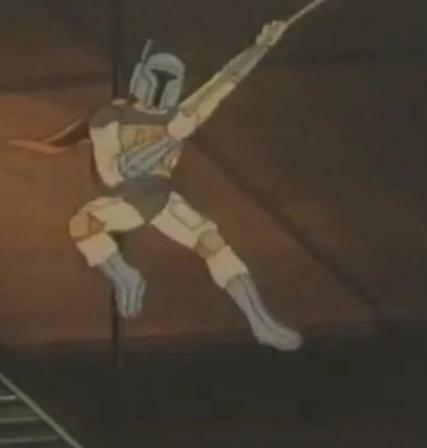 In Boba Fett’s pursuit of his bounty, he shoots lasers from his wrist, uses a rope that he also shoots out to swing down on, and uses his jetpack to give chase to the kids. 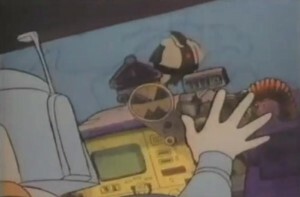 While in pursuit – unbeknownst to Fett – Tig Fromm sets a thermal detonator on the kids’ speeder. 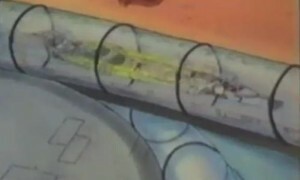 Fett uses his jetpack to get to his speeder, the Silver Speeder. He shoots cords around their speeder to pull them back (“This will slow you down”, Fett says); however, R2-D2 is able to cut them loose. He shoots lasers at their speeder, hitting it (“You haven’t won, yet”, Fett says); however R2-D2 is able to cover up the damage done. Finally, Fett uses a tractor beam to pull them in, but that loosens a thermal detonator that was planted on their speeder and onto his windshield! Boba Fett avoids getting blown up when he jets out of his speeder and away from the blast. When the kids win and regroup, Jord Dusat quizzically inquires: “Was that Boba Fett? I’ve heard of him. Why would a bounty hunter bother with us?” While it makes sense that gangsters would know who this bounty hunter is, Fett’s reputation is so impressive that even these kids know who he is! At the end, Boba Fett comes after the Fromm Gang and upbraids them: “Your meddling has cost my droid, my speeder, and, almost my neck, Tig Fromm!” He figured out that the thermal detonator was put into play by Tig Fromm and went after them. What’s worse, however, is that it seems that Fett was upset that there was meddling in his operation – he could have had it under control: if they hadn’t introduced the thermal detonator into play, he would not have had to abandon the Silver Speeder and would have been able to chase down those kids. It seems that he likes to handle his jobs by himself! Moreover, he was super upset that their meddling could have killed him and that they did cause the loss of his speeder and more. And, because of their meddling and his being tremendously upset at them, he decided to hand them over to Jabba the Hutt (“Let’s go! I’m turning you over to Jabba the Hutt for the reward.”), since he not only no longer owed Sise Fromm anything, but also was okay with giving them over to Jabba the Hutt. 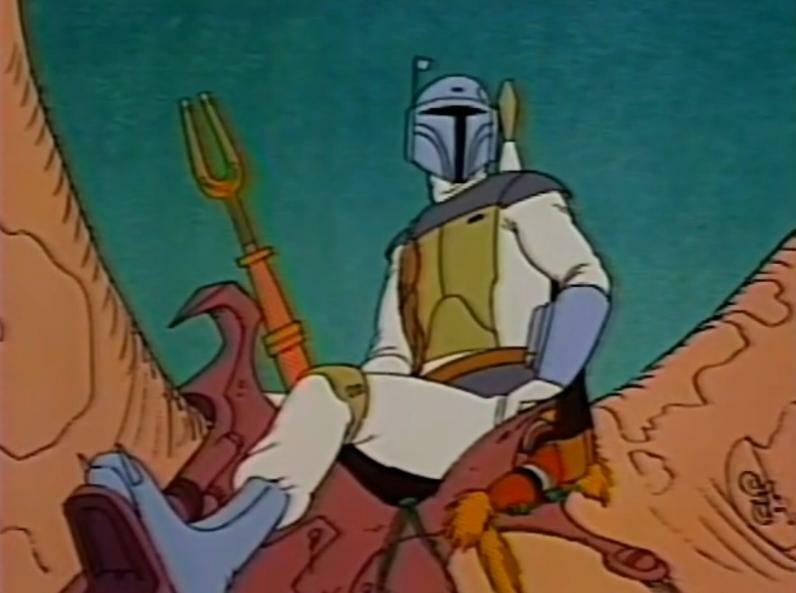 Boba Fett has a huge reputation: whether gangster or just a person of the galaxy, the reputation of Boba Fett as a bounty hunter is well-known. This indicates that he has done stuff to elicit quite the widespread awareness of him. He is about business: in his dealings with Sise Fromm, he says he is there because of the favor he owes – he is fair with him. However, otherwise he would have turned him in (at the outset). He is quick: whether it’s using his jetpack or speeder, he is quick to catch up to whomever he needs to. He has a lot of stuff: whether it’s a droid, a speeder, or the various gadgets on his own person, he is well outfitted to do what he needs to get the job done.